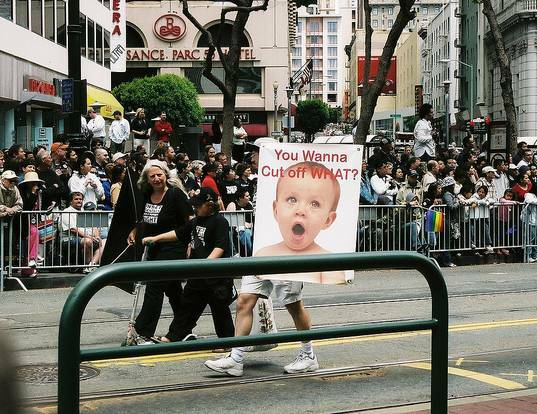 Back in November we posted about how some San Francisco residents have been pushing for a ban on baby circumcision. That post caused quite a stir with readers. In fact, more than 1,400 of you (and counting) have voted one way or the other about whether or not circumcision should be banned. Now, the ban has moved from lively debate to actual possibility. The lead group seeking to ban male baby circumcision in San Francisco, has managed to get this controversial measure on the November ballot. On Wednesday, city elections officials confirmed that the anti-circumcision group, headed up by anti-circumcision proponent Lloyd Schofield, has indeed gathered enough signatures to get the measure on the ballot. Residents still need to vote of course, but if the anti-circumcision measure passes, circumcision would be prohibited among males under the age of 18 and the act of circumcision may be punishable by a fine of up to $1,000 or up to one year in jail. Additionally, if the measure were to pass, parents would not be allowed to seek circumcision for a child for religious reasons. While many parents have debated the merits (or not) of circumcision for years, this is the first time that an initiative about baby circumcision has actually made it to the measure stage. Learn more about the the pros and cons of circumcision. For anti-circumcision advocates, this all sound pretty good. Still, this may be one initiative that won’t see the light of day. Many opponents say the proposed ban is in clear violation of the First Amendment. An actual ban will probably face some serious legal challenges due to religious freedom violations. Now that said, it’s possible that even if challenged, a ban might stand. The United States has banned other questionable religious acts before. For example, it’s arguable whether or not female circumcision (FC) or as many call it, female genital mutilation (FGM) is performed for religious reasons or not – some say it is, some say no. The debate is a moot point in the USA though, because in 1996 Congress enacted law that prohibited any genital mutilation of females under the age of 18 and further directed the government to take on a huge goal of eradicating the practice outside the USA. With this in mind, it’s easier to see that a male circumcision ban isn’t as unlikely as some think. Now, what do you think? Is a ban on male circumcision an excellent idea, a very bad plan or are you stuck on the fence? Let us know in the comments.